San Luis Obispo, CA (USA) -- Five decades after fleeing their homeland, one group is dedicated to keeping Tibetan culture alive. The Buddhist monks of Drepung Loseling Monastery bring their touring show, “Mystical Arts of Tibet,” to the Performing Arts Center in San Luis Obispo next week. 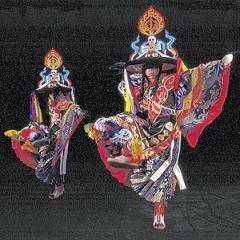 < The Buddhist monks of Drepung Loseling Monastery keep Tibetan culture alive through sacred music and dance. “We believe that the very life force of our nation is its culture and its ritual traditions,” said Tsepak Rigzin, assistant program director at Drepung Loseling Monastery Inc. Established in 1416, the Drepung Loseling Monastery was once one of the largest monastic universities in Tibet. At its height, the Buddhist monastery in the hills north of Lhasa, the Tibetan capital, housed about 10,000 monks. When political persecution forced Tibet’s spiritual leader, the Dalai Lama, to flee in 1959, about 250 monks from the monastery escaped with him, Rigzin said. They found refuge in the small town of Mundgod in southern India. Monastery home, Rigzin said. The monastery also has about 25 members based in Atlanta, Ga. According to Rigzin, the monastery’s purpose in North America is clear: to educate Western students, scholars and the general public about Tibetan Buddhist traditions, and to help preserve Tibetan culture. Monks have been touring under the auspices of “Mystical Arts of Tibet” since the late 1980s, he said. Their Nov. 5 concert, “Sacred Music, Sacred Dance,” features the ancient art of polyphonic throat singing and chanting. Monks use their mouths and throats to produce multiple pitches simultaneously, creating a sound that is haunting, holy and deeply primal. “It has its own ambience and carries its own special blessings and energy,” Rigkin said. In Tibetan religious practice, he said, chanting and singing is seen as a form of meditation. Practitioners may be offering devotions, seeking enlightenment or reflecting on the teachings of great saints and masters. Carefully choreographed dances accompany the music, offering healing for the environment and the community. “In this music and in this dancing, we’re able to see a reflection of Buddhist principles,” Rigzin said. Over the years, the Drepung Loseling monks have appeared on the soundtrack of “Seven Years in Tibet” and performed Phillip Glass’ Academy Award-nominated score for “Kundun” in concert. They’ve also shared the stage with the likes of Paul Simon, Sheryl Crow and the Beastie Boys, performed at the 1996 Atlanta Olympics and appeared at a Fourth of July celebration in Washington, D.C.
Two of the monks’ albums, “Sacred Tibetan Temple Music” and “Sacred Music/Sacred Dance,” have topped U.S. New Age music charts. “It’s considered a special privilege to be chosen for that group,” said Rigzin, adding that joining the Mystical Arts of Tibet tour requires extensive training and spiritual study. who range in age from their 20s to their early 40s. Because performances tend to be physically taxing, Rigzin said, they require strong, energetic participants. In addition to musical ability, the Drepung Loseling monks must also possess artistic skills. During their four-day residency, the monks will create a sacred Tibetan sand mandala at McPhee University Union. The ritual seeks to re-consecrate the Earth and its inhabitants. After an opening ceremony held at noon Tuesday, the monks will draw an outline on a wooden platform. They’ll then fill in geometric shapes and sacred symbols by pouring colored sands through metal funnels, like water. “It is an ancient art that belongs to the old world of humanity,” Rigzin explained. The monks will also host a community sand-painting project, providing sand, tools and instruction. The sand paintings will be destroyed on Nov. 6 as part of a closing ceremony symbolizing the impermanence of life. Although audience members tend to approach Tibetan art and culture on different levels, Rigzin said, most people find “Mystical Arts of Tibet” a positive experience. For the Drepung Loseling monks, he added, practicing sacred rituals in a secular setting is a way of reaching out to the world. “(Tibetan culture) can inspire. It can connect others with healing energy,” Rigzin said.